Teterboro Airport was operated by Port Authority of New York and New Jersey between 1949 and 1969. It was leased to Pan Am World Airways on January 1, 1970 under a 30-year lease agreement with the Port Authority. On September 1, 1989, Johnson Controls World Services, Inc. was assigned the lease to operate Teterboro Airport for the duration of the 30-year lease agreement. Teterboro Airport Web Site Operated by Johnson Controls World Services, Inc.
Teterboro Airport is located in the Boroughs of Teterboro and Moonachie in Bergen County, New Jersey. It is twelve miles from midtown Manhattan, via the George Washington Bridge or Lincoln Tunnel. Teterboro Airport consists of 827 acres: 90 acres for aircraft hangars, maintenance and office facilities, 408 acres for aeronautical use and 329 undeveloped acres. Teterboro is the oldest operating airport in the Port District. Walter C. Teter acquired the property in 1917. During World War 1, North American Aviation operated a manufacturing plant on the site. After the war, the airport served as a base of operations for Anthony Fokker, the Dutch aircraft designer. The first flight from the present airport site was made in 1919. 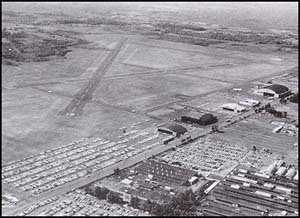 During World War II, the airport was operated by the Army Air Force. The Port Authority purchased it on April 1, 1949 from Fred L. Wehran, a private owner. Since 1970, the Port Authority has invested approximately $37, 000, 000 to upgrade the present facilities and open new areas of service to the aviation community. There are one thousand and forty-one (1,041) full-time and ninety-six (96) part-time employees at Teterboro Airport. A total of 1,137 employees, of which 22% reside within a 5 mile radius of the airport, 62% within 10 miles and 94% who live within 15 miles. According to the National Plan of Integrated Airport Systems, Teterboro Airport is designated as a "reliever" that serves vital interests and the general aviation requirements of the Northern New Jersey and the New York Metropolitan Area. The facility consists of a two runway configuration: Runway 1-19 (North/South) is 7,000 feet long and Runway 6-24 (NE/NW orientation) is 6,012 feet. The airport is a 24-hour public use facility that offers both visual non-precision and "all weather" precision landing capabilities. It is important to note that conditions stipulated in the operating agreement between the Port Authority and Johnson Controls prohibit Teterboro from accommodating scheduled aircraft carrier operations due to its functional role as a general aviation reliever airport. Additionally, a weight restriction is imposed which excludes use of the airport by aircraft with operating weights in excess of 100,000 pounds. As a result, Teterboro's utilization is comprised of a broad range of general aviation aircraft. In 1973 Teterboro Airport voluntarily applied for and received certification for safety under Part 139 of the Federal Aviation Regulations. It was the first general aviation airport in the nation to have this certification. Under this certification, the airport operator must meet prescribed operating and safety standards, terms and conditions as required by the Federal Aviation Administration (FAA). These regulations dictate facility requirements and procedures that are followed at air carrier airports. Charter/Aircraft Leasing - Companies charter aircraft either to supplement their own aircraft or to travel if they do not own an airplane. Cargo -Teterboro Airport provides services for couriers destined for the country's network of Federal Reserve banks and its main Clearing House in Philadelphia. It is also the hub for many small package cargo shipments. Public Service - Teterboro Airport serves as the primary receiving point for hearts and other human organs used for lifesaving transplant operations performed at all hours at medical centers throughout the Metropolitan Area. When the permanent noise monitoring system was installed a unique committee was created. This committee included the airport owners and management, U.S. Congressional Representatives, State Senators and Assemblyman, local mayors the FAA and airport users. The purpose of this committee is to oversee the noise monitoring system and to recommend noise abatement programs for Teterboro Airport. The TANAAC has been held up as an example for others to follow, because it has proven that airports can co-exist and be sensitive to the needs of the surrounding communities. The Airport's nationally recognized noise abatement program is staffed continuously and utilizes a 24-hour telephone hot line to answer all noise complaints. The program also made way for implementation of a preferential runway use policy to avoid flights over noise sensitive areas. The noise abatement program was enhanced with the installation of a $300, 000 computerized noise monitoring system comprised of six monitors in a critically sensitive noise area in five surrounding communities. This monitoring system is currently being upgraded by the Port Authority. Nineteen hangars on the airport have a total area of approximately 412,000 sq. ft.
Two large office buildings centrally located, with a total area of 133, 418 sq. ft.
Additional office and shop space with a total area of 165,611 sq. ft.
An administration building, maintenance facility and two fuel farms. A control tower was constructed on the east side of the airport in 1975 by the Federal Aviation Administration, and went into operation on October 29, 1975. There are two runways: Runway 6-24 and Runway 1-19. Runway 6-24 is 6,015 feet long and 150 feet wide, equipped with high intensity runway edge lights (HIRL). Runway 6 approaches have an instrument landing system (ILS) and a 2,000-foot simplified short approach lighting system with runway alignment indicator lights (SSALR). Runway 24 approach is equipped with VASI and REILS systems. Runway 6-24 underwent complete overlay in 1985 and was grooved in the summer of 1987. Runway 1-19 is 7,000 feet long and 150 feet wide, equipped with HIRL. Both runways 1 and 19 are equipped with REILS systems. Runway 1 approach is equipped with a VASI system. Runway 19 approaches have an instrument landing system (ILS). Runway 1-19 underwent complete overlay in 1987 and was grooved in the summer of 1987. Runway 1 is the preferred runway for noise abatement procedures. Approximately 4.2 miles of taxiways exist on the airport. Most are 60 feet wide and are equipped with centerline lighting systems. Johnson Controls and Teterboro Aiport employees are actively involved in many different community service programs. The airport Manager serves on the finance, government relations and executive committees of the Meadowlands Chamber of Commerce. The airport, which is an original member of the Chamber, is a major sponsor of all Chamber activities and events. Is one of the founding members of the New Jersey Aviation Hall of Fame, which is located on the airport, and a major sponsor of all its activities and fund raising programs. Sponsors an annual Golf Scholarship event to raise funds for local high school seniors to use toward their continuing education in an aviation-related field. Since 1987 approximately $30,000 has been awarded. Sponsors an annual five-kilometer run for the benefit of the Bergen County United Way. In 1999 over $8,000 dollars was raised through this event.